How was East Africa different to South Africa? We have previously enjoyed some wonderful game experiences in Southern Africa, however East Africa was a completely different ball game. It is the sheer number of animals which is just staggering and awe inspiring. 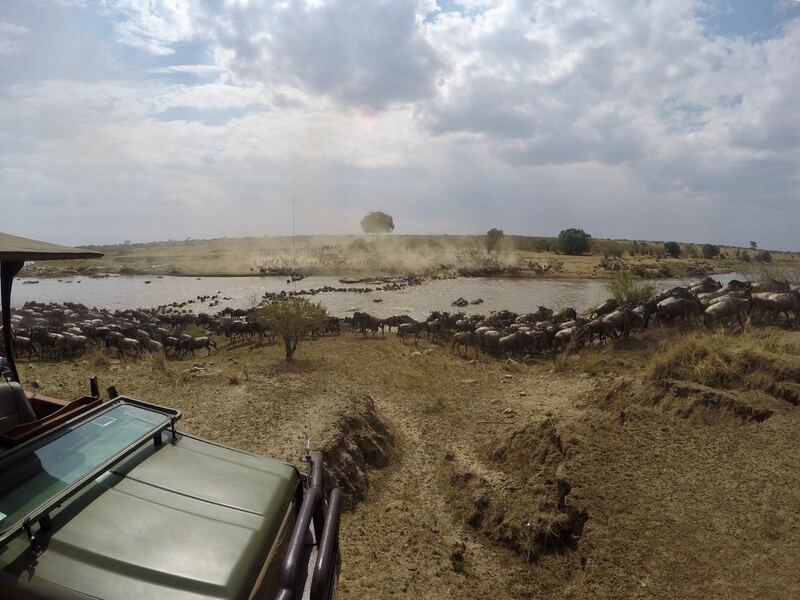 Never have we been so immersed in the wildlife and able to see so many different animals and on so many different occasions. Was witnessing the migration as you had imagined it would be? The migration was truly a bucket list item for us and we weren’t disappointed. 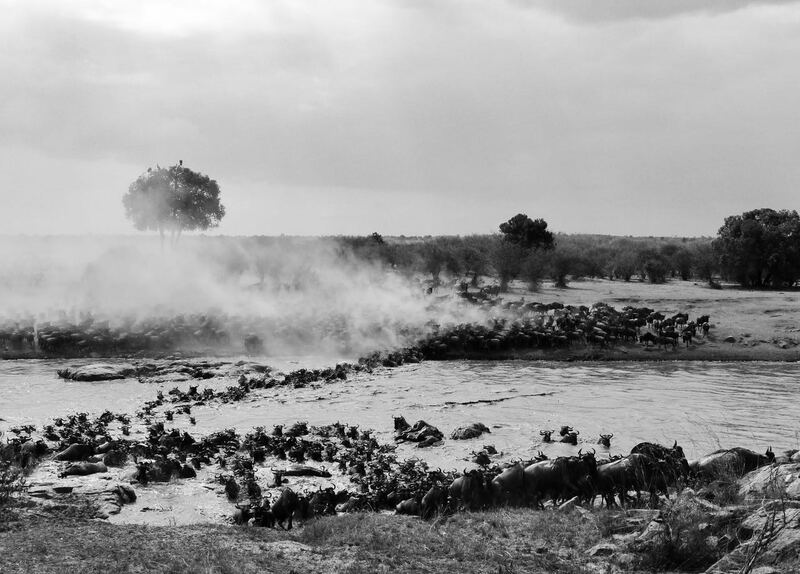 With the expert knowledge and understanding of our guides, we were able to witness several crossings, at different parts of the river and each with their own unique characteristics – the first had stampeding wildebeest once crossed, the second we witnessed the cruelty of nature as the crocs took their share, the third was super special as we were only one of two trucks, the dust clouds swirled, the zebra made the first tentative steps and then thousands of wildebeest ran from kilometres away to cross, the fourth as some of the confused animals ended up heading back the way they came. The noise, the commotion, the waiting, the desperation, the winners, the losers – truly amazing! Which was your favourite camp in East Africa and why? It’s really tough to pick just one, but if pushed, we’d have to say KazKas Mara in the Serengeti. Set atop the hill, amongst the trees, this semi-permanent camp looks down over the plains to a small river frequented by lion, wildebeest and topi. 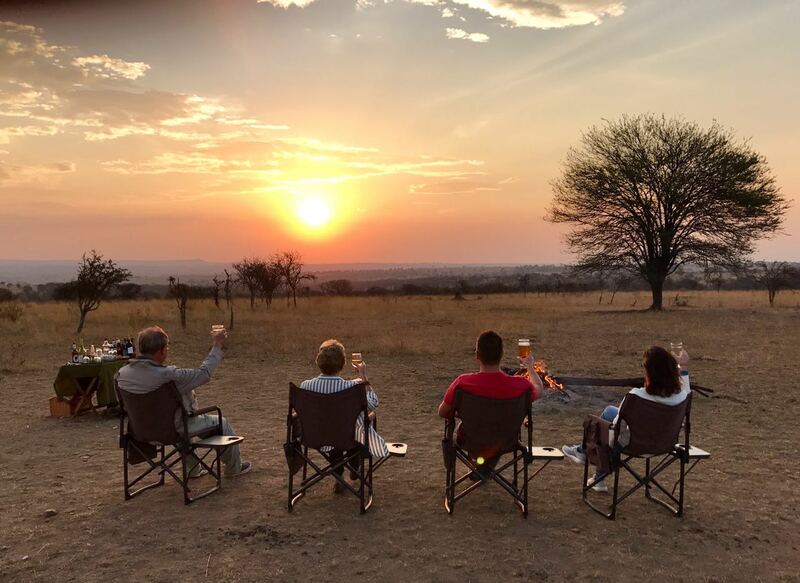 The staff were incredible – they made us feel so welcome and every day surprised us with something special like a lunch in the bush, our own personalised fire and sundowners, champagne popping – wonderful hosts. What did you think of the staff at the camps you stayed at? 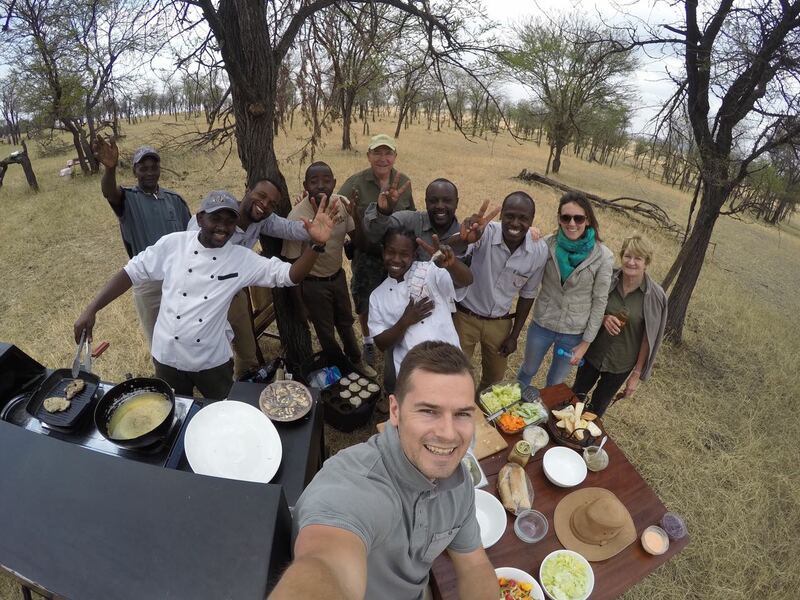 At every place we stayed, from Rivertrees in Arusha, to Plantation Lodge in Ngorongoro, KazKas Mara Camp in the Serengeti and finally Naibor Camp in the Masai Mara, and then all the drivers and guides in between, everyone was on point. The service was fantastic – polite, well informed, courteous, helpful – we were warmly received at every turn and really enjoyed getting to know and sharing stories with the various characters. What was your best sighting? 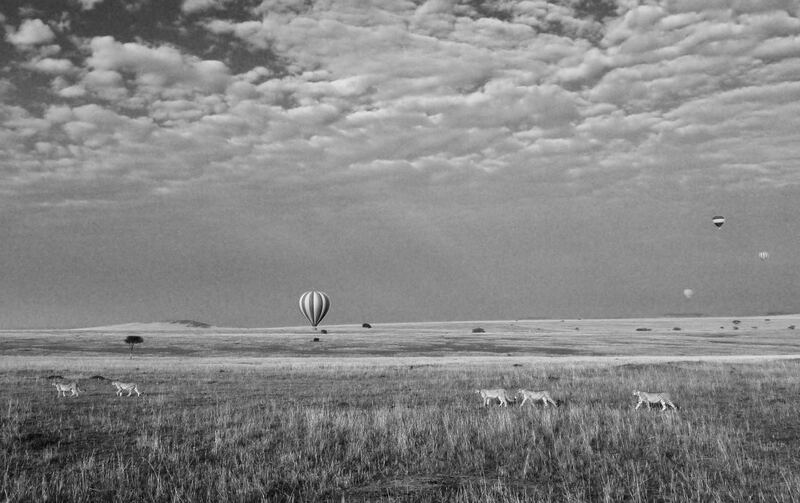 A coalition of five male cheetahs in the Masai Mara – peacefully and calmly surveying the great African plains in the early morning sunlight. Then taking a stroll through the long grass to a favourite tree for some territory marking before catching 40 winks. If there was anything about your trip that you would change what would it be? If you could go back to just one moment of your trip which one would it be? The early morning balloon ride was pretty spectacular – whilst it can be hit and miss with the weather, sunrise and wind direction, there’s something very special about the whole experience. A creakingly early morning start with a cup of coffee held against the cold and barely open eyes – a bit of night time safari action including bat-eared foxes, two very large and pretty grumpy hippos in the middle of the road, spring hares and darting rabbits – to arrive at the innocuous balloon site where the team of men are hard at work getting everything set up – and as the balloon starts to take hold, it’s a dash of one out one in to load the passengers before setting sail, just as the sun breaks the horizon. What did you think of the accommodation? We really enjoyed having such a diverse mix of accommodation from the lodges in Arusha and Ngorongoro to the camps in the Serengeti and Masai Mara. Each was very well appointed, beautifully maintained, clean, secure and sympathetically designed to the location. Service across the board was faultless. What about East Africa do you miss the most having now left it? The big skies, the endless horizons and the warm and friendly people. The Rift Valley and the resulting natural phenomena of the topography creates a unique environment for the flora and fauna. By comparison with some other parts of Africa, East Africa delivers an unprecedented volume and richness of game such that you can enjoy seeing the same types of animals but in different settings and exhibiting different behaviours – for example, we enjoyed seeing lion almost every day with particular highlights being tree-climbing, all ages of cubs, seeking reprieve from the sun in the shade of our bakkie, being chased by a hippo, hunting training for the adolescents, two males on the prowl…and so on. Same with rock climbing elephants, rhino watching giraffe and bath time hyenas. If you could choose any camp in Africa to go next – where would it be? Uganda/Rwanda/Congo to see the gorillas…. Thank you so much Aly and Dave – we so loved having you and your family and we hope to see you back on African soil again soon!